Welcome to FilmPlus. We have been serving Toronto's professional photographers and photo enthusiasts for thirty years. As their needs have changed so have we. One thing that never changes is the priority we place on quality service, be your medium of choice digital or non-digital. With that in mind we have an extensive, ever-enlarging rental department with professional cameras and peripherals for both the digital and analog customer. See our Rental Price List for our reasonable daily and weekly rates. Come into FilmPlus for our unparalleled colour selection of cored seamless, a wide range of Epson® ink jet papers and cartridges, lighting and camera filters, and all manner of accessories. While we have made the transition to the world of digital photography, we enthusiastically support traditional analogue photography needs. We sell professional films and darkroom supplies, and can offer advice to those seeking to venture into the world of silver halide based processes. So, have a good browse of our website, or better yet, come into our store for a closer look. Please contact us with any questions or requests. 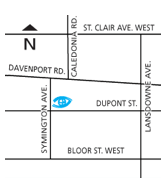 We are located just north of Dupont on Symington...your west-end source for professional photo products and rentals.